The Ultimate Power Barrage Box by TNT Fireworks. Weighing in at 2.3kg, this barrage box is packed full of mixed aerial effects. Instead of getting loads of tiny fireworks, you get 9 decent sized, assorted garden fireworks. 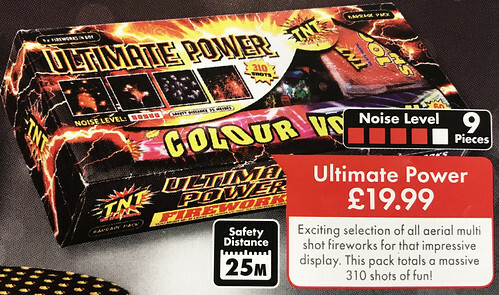 A huge array of sound and visual aerial effects; making this a great selection for the back garden family fireworks display.